Hi! Happy days after Christmas and happy new year! Thought I would post about my spontaneous gingerbread and sugar cookie hearts for the rim of a mug. My idea originated from this amazingly cute idea. 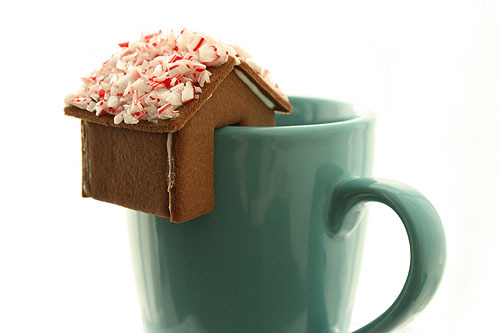 Gingerbread houses that perch on your mug. Really check out the post it is super cute but more time consuming than I desired to put into my cookie making this year...soooo little hearts that fit on the rim of our mugs were my next best idea. These were very simple I had a heart cookie cutter just the right size. After I cut out the hearts with my cutter I then used a sharp knife to slice/cut out a small spot for the cookies to hook onto the rim of our mugs. After they baked and while they were still soft and hot I cut away any dough that had spread and covered my little hook. I mainly eye balled it for where to cut. About 90% of them worked like a charm but there were a few I cut that were a little off. The only thing is I forgot to sprinkle sugar on the top of the cookies (I was multitasking, getting kids down for bed while making these little guys) so they are not as pretty as they could be, but YOU could pretty them up quite a bit. I had done a few practice cookies earlier this week when I was making cookies and that helped me quite a bit. I used ginger bread and sugar cookie dough for these little hearts that you can dip in coffee or tea. A perfect small and simple treat to eat with your hot drink. Hope this is fun and useful to you over the next few more days of celebrating. Keeping it simple in our west corner. I am linking up to these fun link parties. Love your heart cookie idea. I've looked at those gingerbread houses several times too. Your version is super cute and doable! This is adorable!! I totally love it, what a great idea for kids OR adults!! Hi Becky! I love your cookie idea. The little Gingerbread house on the mug is a bit over the top, but your cookie idea is great. I can't wait to see The Help! those are a great idea, even more sugar with my hot chocolate! Great idea! I saw the original post with the gingerbread houses but while I thought they were cute, they were just too complex and to big for me. I will definitely be using your great idea! How cute. I'll make these the next time I have people over. Heart cookie idea is very good and awesome. How darling. Wish I could have been there for the great movie & treats. Thank you for linking this idea to Fabulous Friday! Thank you for linking up. This is so cute! I love to have something sweet with my coffee and you gingerbread heart cookies look like something I could make! Thanks for sharing! Really love the idea! Will do the same for the kids! In my little west corner of Turkey I am finding and creating beauty in the everyday and ordinary. I am using what I have to create with my children and to invest in others. We are just an ordinary family praying desperately to make an extra-ordinary difference in this world we live in. End it. Modern day slavery. Upcycling clothes into doll clothes. You are very welcome to copy the ideas on this blog!! If you use the pictures please link back to Creative Contentment as the pictures have been taken by me and are owned by me. But please DO NOT use any of the pictures of my children. Thank you.